I am very happy with our service. Great customer service and great results! The service technician is always friendly, professional and willing to answer any questions that we might have. I would definitely recommend McCloud Pest Management to friends and family. We had McCloud Pest Management years ago and were forced by a customer to change companies. We no longer have this customer and immediately switched back to McCloud. Their Techs are very professional and do a great job!! Great service and fantastic to work with. McCloud is always attentive to my communities needs. Excellent company to work with and cost effective! Very professional and personable employees. Chris takes great care of our facility and ensures as any issues may arise, are treated promptly. Overall McCloud has given our company fantastic service. I would recommend to anyone needing a pest control solution to give them a call! Very thorough and are always courteous. We have been very happy with their services. Jason is extremely professional and very easy to work with. Many times our schedule and areas of concern change, but Jason is constantly working with us to make sure all of our needs are met. We are completely satisfied and we continue to recommend McCloud to our local vendors and customers. Very thorough and professional. Highly recomend. Initially McCloud's treatment worked very well; however, in the past year the type of treatment being given doesn't seem to be working. I have been told by the residents that the technician will not listen to them when they try to explain their problem. There have also been some problems with scheduling. Job well done. Easy application!! I have been very pleased with McCloud, and our recent service on 8/15/17 was very good. Always professional, always very responsive. A++ service. The service representative that checks my house is very professional and informative. I would recommend this service to others. Working with Damon and McCloud has always been a positive experience. He is dependable, courteous, knowledgeable and always demonstrates excellent customer service. Our technician does a great job of keeping pests out of our building (which is a challenge with two dock doors!!). He is very professional, and is considered one of our T & D Service Center family members. It was a little expensive but I hope you get what you pay for. We have been using McCloud for almost 30 years. They have always been very responsive to any immediate situation we have, as well as the monthly maintenance. 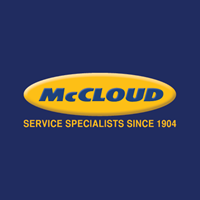 My company has worked with McCloud for 15 years. Service has always been top notch. Anytime there has been a pest issue McCloud has responded extremely fast. A+ company. We've been using McCloud for several years. Courteous, professional and always do a great job!